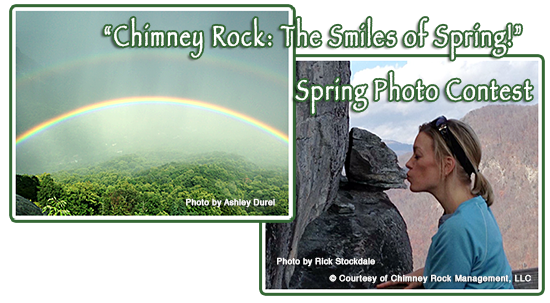 Chimney Rock NC - Chimney Rock: Spring Photo Contest- Smiles of Spring! Wildflowers springing from the ground �are a sign that spring and warmer weather are right around the corner. Capture photos of your family and friends enjoying the Park and enter them into our Shades of Spring Photo Contest for a chance to win fabulous prizes.� We'll use the winning entries on our website and Facebook album, and you'll win some fun prizes. Photos must be taken within the Chimney Rock section of the Park. Second Place�� A Chimney Rock prize package including two passes to Chimney Rock, lunch for two at the�Old Rock Caf��and two tickets for a tour with�Lake Lure Boat Tours. People's Choice ��Selected by our Facebook fans, the winning photo will be featured as the cover photo of our Facebook page for two weeks and the cover of our Pinterest board of winning photos. Prize includes two Park admission tickets, lunch for two at the�Old Rock Caf��and a $20 gift certificate for�Old Time Photo�in Chimney Rock Village. Photos must be taken within the Chimney Rock section of the Park. For more information on the contest or how to submit your photo(s), call (828) 625-9611 or toll-free (800) 277-9611, or email�visit@chimneyrockpark.com.